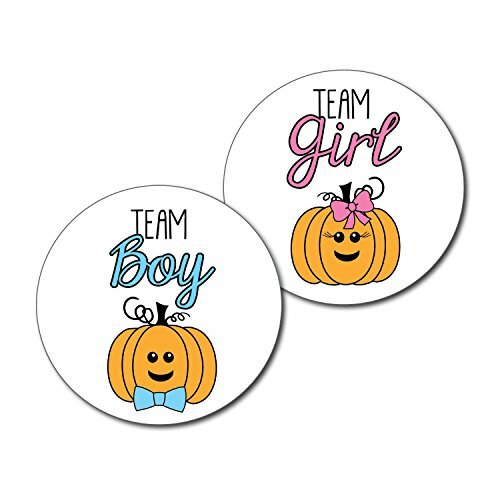 2.5'' Set of 36 Pumpkin Team Girl & Team Boy Gender Reveal Party Stickers - Halloween Thanksgiving Autumn Fall Baby Shower - pink & blue by Best Wishes Boutique at Nicky's Blog. Hurry! Limited time offer. Offer valid only while supplies last. Perfect for a gender reveal party - have your guests choose a side! Each set will include the two versions of stickers shown, 18 of each (36 total). Perfect for a gender reveal party - have your guests choose a side! Each set will include the two versions of stickers shown, 18 of each (36 total). These stickers have a smooth matte surface and self-adhesive back - simply peel and stick. They stick well to most clothing, or smooth surfaces such as a display board for casting votes. Add to favor boxes, treat bags, disposable cups, and so much more - a great way to add some fun to your Big Reveal! If you have any questions about this product by Best Wishes Boutique, contact us by completing and submitting the form below. If you are looking for a specif part number, please include it with your message.